Autumn is here which is why I skipped going to the 725 year celebration in Düsseldorf on the weekend (too much rain) and spent my time on knitting, listening to the most hilarious audiobook in a long time (more on that in my wednesday post) and painting my nails. Do you remember my “Inspired by an artwork” Nails during the 31 Days Nail Challenge? Well same design, different colours. I love those muted dusty reds and pinks. And what better than to combine them in a quite quick free hand mani. 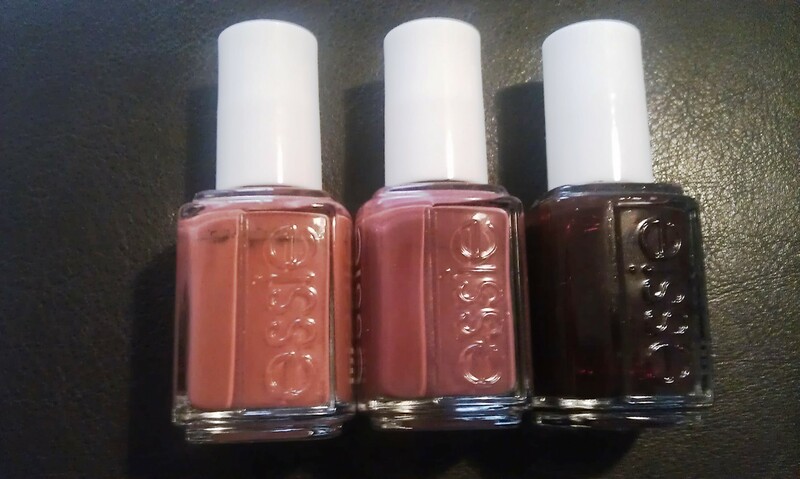 They are from all essie: “in stitches” is the lightest one, then “angora cardi” and the darkest on top is “skirting the issue” from last year’s fall collection. For more nail designs check out my 31 Days nail challenge posts. This entry was posted in Nail Art and tagged angora cardi, essie, in stitches, Nailpolish, skirting the issue by kathatravelling. Bookmark the permalink.